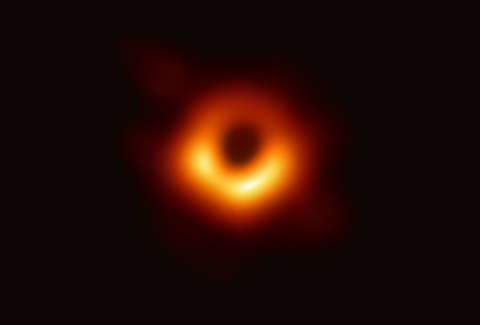 In what may be the most epic "pics or it didn't happen" moment in recent memory, scientists just unveiled the first-ever photograph of a black hole, providing the first real visual evidence of one of the universe's most mysterious and strange phenomena. It's blurry, yes, but it's also remarkable. During six simultaneous press conferences held around the world on April 10, scientists excitedly unveiled the long-anticipated photo, which was captured by the Event Horizon Telescope -- a global network of eight observatories that create a single Earth-size telescope powerful enough to magnify never-before-seen parts of the universe. In the image, the insanely large cosmic object is shown surrounded by a bright lopsided ring of light, and while it may not look all that astonishing upon first glance, rest assured it is. The unbelievably massive black hole, which sits at the center of a galaxy known as Messier 87 some 55 million light years away, is 6.5 billion times more massive than the sun. Black holes are famously deep and dense, with such strong gravitational forces that not even light can escape them. Until now, though, their existence has remained largely theoretical. This photo serves as proof that they are indeed a very real thing. "Here it is," said Sheperd Doeleman, a project director of the EHT during the press briefing in Washington, DC. "This is the strongest evidence that we have to date for the existence of black holes." The photo is the result of years of collaboration between researchers around the world, who designed the EHT project to hunt for black holes using computer analysis and capture images just like this one. To do so, they had to create a telescope that could detect the same level as detail "as seeing an [sic] date on a quarter in L.A. from D.C." according to a tweet from the National Science Foundation. And even though this marks a hugely significant moment in the history of space exploration, folks on Twitter wasted no time turning the photo into a meme and cracking a colorful array of b-hole and Eye of Sauron jokes. It is 2019, after all, and that's just what you do. These are some of the best we've seen so far.